You’ll love this stunning White Chocolate Raspberry Layer Cake. Two layers of moist white chocolate mud cake covered in a cheat’s raspberry buttercream. This post is sponsored by Almond Breeze. This cake is everything. 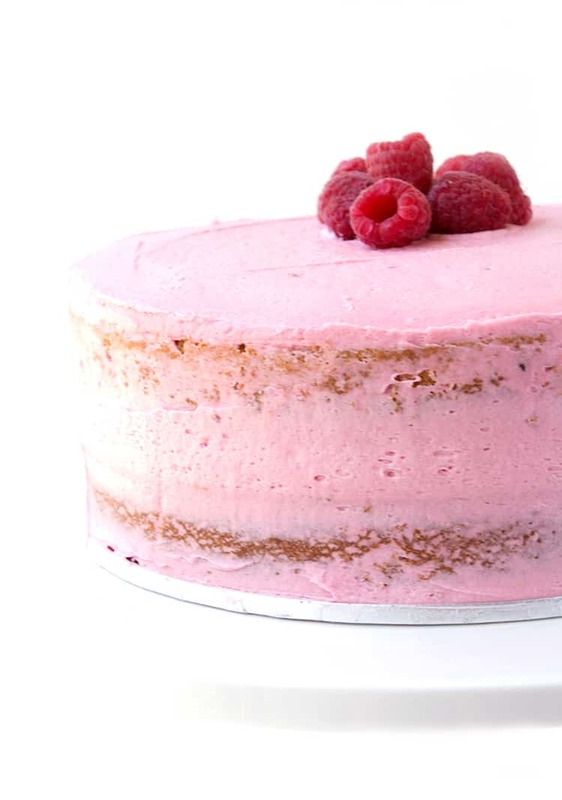 It’s soft and moist with beautiful flavour, and a pretty pop of colour thanks to the creamy raspberry buttercream. If you’re looking for an easy layer cake that’s sure to impress – look no further! Today, I’ve teamed up with Almond Breeze to bring you my new favourite cake. One that I just know you’re going to love. I’ve wanted to share a recipe for a white chocolate cake for a long time. But it’s taken quite a while for me to find the perfect white chocolate cake that will rival any chocolate cake. But it’s finally here and I’m over-the-moon with the result. Using the classic melt and mix method, this cake is very simple to make but delivers delicious results every time. 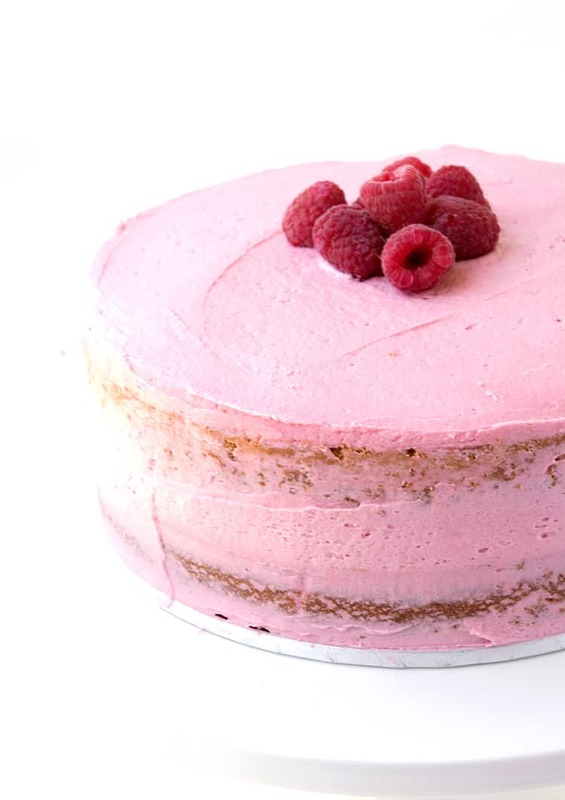 Dotted with frozen raspberries, the cake itself is light but moist with a crisp crust. 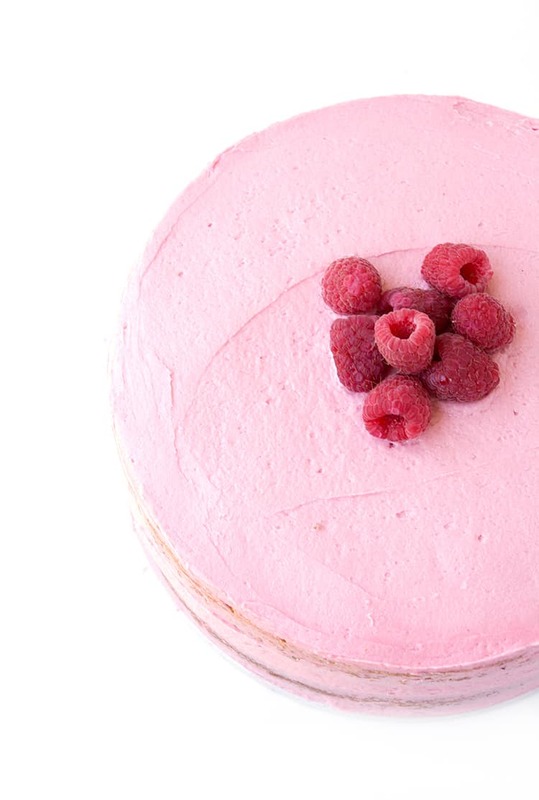 And it pairs perfectly with the fruity raspberry buttercream. For a quick and easy raspberry frosting, I’ve used a good quality raspberry jam. It adds instant flavour and colour but keeps the thick, luscious texture of the buttercream. So not only does the frosting taste on point, it also spreads easily, making it the perfect frosting for a layer cake. Light. Creamy. Delicious. Add a few fresh raspberries on top and boom! The perfect White Chocolate Raspberry Layer Cake. I’ve made this cake too many times to count these last few weeks and honestly, I could eat it face-first straight out of the oven. 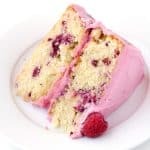 The soft buttery white chocolate cake has a lovely crumb, almost a mud cake texture, with colour and freshness from the raspberries. So what’s my secret for the gorgeous flavour and texture of the white chocolate cake? A good dose of good quality white chocolate, lots of butter and almond milk. Let me show you just how easy this cake is to make in the video below! 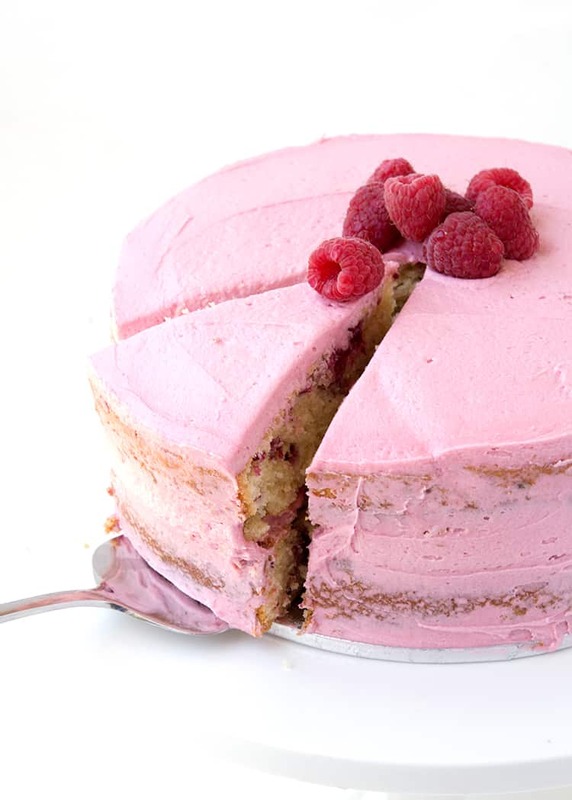 A delicious white chocolate raspberry mud cake with a creamy raspberry buttercream. Preheat oven to 180C (360F). Grease and line two 8-inch round cake tins with baking or parchment paper. In a medium saucepan, add butter, white chocolate, sugar and almond milk. Place on medium heat, stirring until smooth and sugar has dissolved. Set aside for a few minutes to cool slightly. Add eggs and vanilla to cooled white chocolate mixture and stir until combined. Add flour and baking powder and stir until combined – don’t worry if the batter is a little lumpy. Gently fold through the raspberries. Divide the cake batter between the two cake tins and place in the oven for approximately 30-35 minutes or until a skewer inserted in the middle comes out clean. Transfer to a wire rack to cool completely. To make the raspberry buttercream, add butter to a large mixing bowl. Beat with an electric mixer until light and fluffy. Add vanilla and beat again. Add 1/3 icing sugar and 1 tablespoon of milk and beat until smooth and creamy. Add 1/3 icing sugar and 1 tablespoon of milk and beat again. Finally, add the remaining 1/3 icing sugar and beat until smooth. Add raspberry jam and beat until smooth and creamy. Place one cake layer onto a cake board or stand. Cover the top with raspberry buttercream. Place second cake layer on top (upside down for a nice flat top). Frost the top and sides of cake. Top with fresh raspberries. For a smooth frosting as pictured, put your raspberry jam through a sieve to get rid of the seeds before adding into your buttercream. 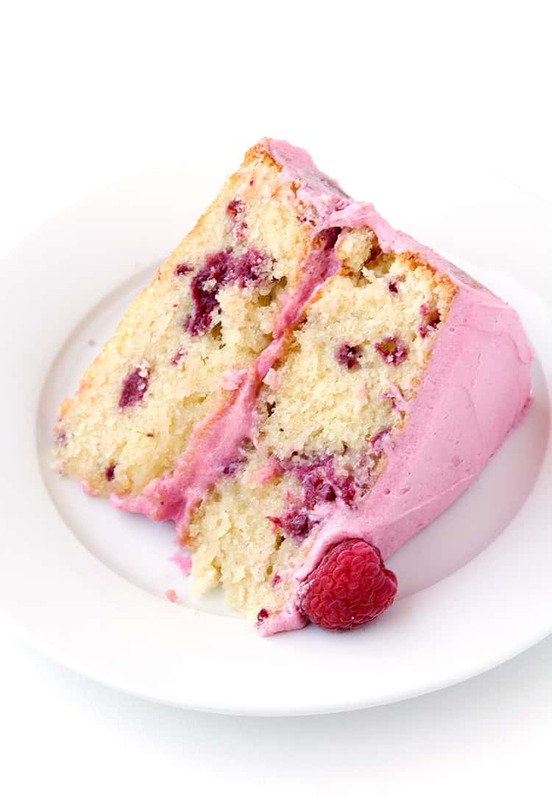 Is the raspberry flavor srong in this cake without the frosting? I have someone wanting a white chocolate raspberry cake for a wedding. I did one sampling of a different recipe but you couldnt taste the raspberry. The white chocolate seemed to over power the raspberry. They want a white chocolate frosting and want to be able to taste the raspberry. Hello! Next to the recipe its shows that you can scale the recipe up x1, x2 and x3. If I scaled the recipe up X3 would this be enough for a 12inch round cake tin? Hi Katie, thank you for your comment. I’m actually in the process of trying to remove that scaling information, as it has been automatically added to my recipe cards. It’s not to say it wouldn’t work but I haven’t tested the recipe by doubling or tripling the ingredients so therefore I can’t personally recommend it. In this case, I do think doubling it should be ok for a 12 inch size or making it twice – once for each layer. But I don’t want to recommend it because I haven’t tried it. I hope you understand – I’m sorry I can’t be of more help! Hi.. can i make this cake a week in advance and freeze it? Hi Rochelle, yes you can! Wait for the cake to cool completely before wrapping and freezing. I used raspberry jam but it’s not so pretty pinkish like the picture. Should I add food coloring or use a different brand of jam? Made a three layer version for my daughter’s birthday. Went down a treat! Thank you. Ooh so pleased to hear that Louise! Thanks for the lovely feedback! Hi, may I know if the frozen raspberries need to be thawed first. Tq. Hi Julie, great question! No need to thaw the raspberries, just use them frozen 😊 Hope you enjoy the cake! The cake looks amazing. Can’t wait to try it. Could this be made in a 9 x 13 cake pan? Thanks. Hi Sherrie! I haven’t tried it myself but I don’t see it being a problem. You will just have to adjust the cooking time accordingly. Let me know how you go! Hi Jess! Can I use 3 6 inch round pan? What abt the conversion of each ingredient? Hi Anna, I haven’t tried this myself but I don’t see it being a problem. You’ll just have to adjust the cooking time accordingly. Hope you enjoy it! Hi Jess, would this work for a wedding cake? If i made the cake late on a Tuesday night, the wedding is on a friday.. Would it keep? Also will it be ok for stacking with dowel rods its only 2 tiers. I wouldn’t use the butter cream on the outside, I’d use white chocolate ganache and then ice with fondant/sugarpaste. Hi Bobbie, thanks for getting in touch. This cake is lovely and moist so I think it could do well as a wedding cake. My cake always disappears in a day or two, so I’m not sure how it would be after 4 days. My advice is to maybe do a test one so you can be sure? I know how important the cake is for a wedding! Stacking it should be fine, it’s quite a sturdy cake. 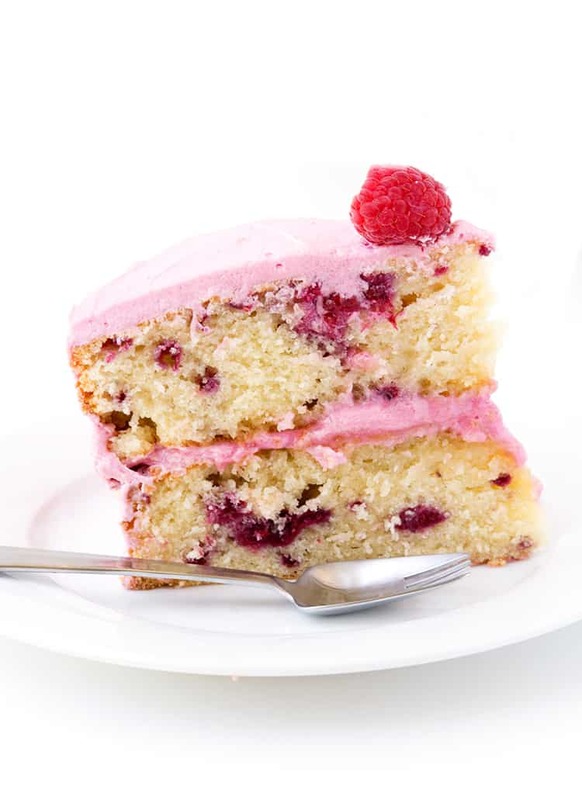 Would it be okay to omit the raspberries in the cake without changing anything else other than maybe less time? Looks so good, but birthday boy requested no raspberries. Hi Mrs C, thanks for your comment. 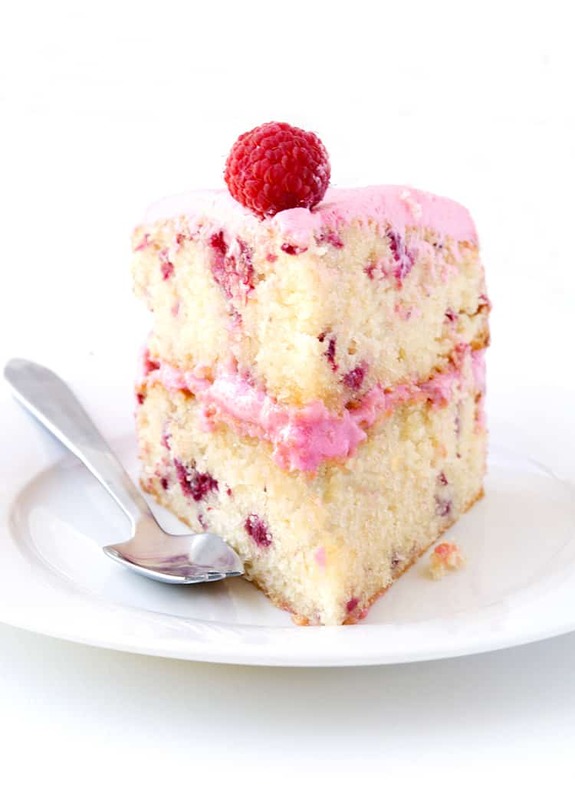 You can absolutely leave the raspberries out of the cake. Blueberries would do nicely or chocolate chips, but it’d also be lovely without any add-ins. I hope you and the birthday boy enjoy it! Thank you so much for getting back so quickly. It worked great. I really want to try it with raspberries now! Hi! Can I refrigerate the batter for later use? Hi! No I wouldn’t recommend this. Ok, thank you Jess! How long does the cake stay fresh? I don’t understand how much sugar to put in the icing? It says 3 1/3 cups in the ingredients and then in the description and video it doesn’t seem like that amount? Hi! As per the recipe, the correct amount of icing or powder sugar for the icing is 3 and 1/2 cups. Hope this helps! Your recipe looks delicious!! My sister is allergic to almonds, I was wondering could I use coconut milk instead of almond milk? Hi Julie! Thanks for reaching out. Unfortunately I have only tested this recipe with Almond milk so I can’t confirm the result using coconut milk. If you do try it though, please let me know how you go! Hi Would you have this receipt for Thermomix? I would love to make it as an Easter treat. Hi Aleksandra, sorry no I don’t have as I don’t have a Thermomix at home. I will do this cake for my best friend’s birthday next week..
Plus can I not melted the chocolate and directly add it in the cake batter? Hi Solene, thanks for your comment. Im excited you’re going to try this recipe! I wouldn’t recommend putting the cake in the fridge, simply because you run the risk of it drying out – and no one likes a dry cake! If you are worried about the frosting, I would try and make the frosting only on the day of serving. As for the chocolate, I recommend following the directions as stated as this is how I have tested the recipe. I hope you enjoy it! Thank you for your answer Jessica! How can I show you the final result? Can’t wait to make this for my granddaughter’s 4th bday. She’s having a unicorn party and this is perfect!!!!! Hi I would really love to make this cake in a smaller version, would you have the conversions for a 5inch tin? Looks amazing would like to make it for an engagement party wondering how long it would keep..
Hi Helen! Thanks for your lovely comment. I do think this cake is best the day it’s made, but Wrapped tightly in plastic wrap and kept at room temperature the cake would keep for 2 days. I recommend frosting it at the last minute. Try to avoid putting the cake in the fridge as it tends to make cakes dry. I really hope you enjoy it! I really liked this cake, especially the creamy frosting. Thanks Josh, so glad you enjoyed it! What a beautiful cake! I love the moist texture of the layers – looks delicious!